The eBay auctions marketplace has been ahead in modernizing Vietnam’s e-commerce. Convenient in the country, and overseas customers looking for Vietnamese goods. Here’s how in English! Vietnam’s online retail market is estimated to more than double by 2020 according to industry’s E-Commerce Association in the country. As the next five year forecast is looking promising, companies are heavily investing in modern e-commerce infrastructure and sellers are looking to tap into the market. In fact, first stage of development has been already reached, looking for the next step leading to booming sales figures. Having tremendous experience of the field on a global level, eBay was quick to establish the technology infrastructure, workforce and a legal framework to support the growth as well as pave the way for entrepreneurs. The momentum is not high just for eBay as numerous players backed by huge investments are looking to chip in. Still the estimated 2012 figures account for just 5% of the total retail figures — lower than many other South East Asian countries. 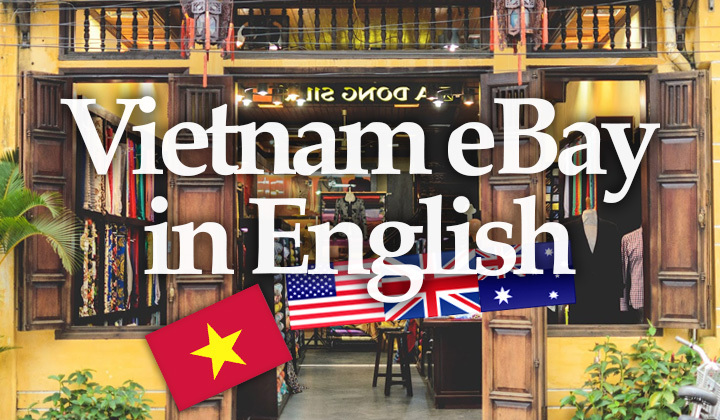 The market is now heavily concentrated in Ho Chi Minh City as well as Hanoi of course, but expanding online businesses to all over the country is the long term key in making the industry comparable to other major Asian countries. The eBay website at eBay.vn is a Vietnamese language version targeted at both buyers and sellers in Vietnam. No native English version of the website exists and therefore you basically the option to (1) use the US version of eBay or alternatively (2) use Vietnamese eBay.vn. You can make purchases sent to Vietnam from all over the world as long as supported by seller. Also you can use it to order from Vietnamese sellers that support international shipping outside of Vietnam. Here you can see all the products that can be only sent within Vietnam. You will have to translate the pages using automatic browser translation, such as the one provided by Google Chrome. Vietnamese can order your products only through the international, English website. To penetrate the local market, you will need to get passed the language barrier or use a drop shipping service. Any questions about the eBay market in Vietnam? All questions most welcome and I’ll do my best to answer them!